The once vacant block in the centre of a small township have since been replaced with a children’s nature-inspired wonderland, creating endless opportunities for play-based learning in a unique setting. The township of Lochinvar, nestled in the picturesque Hunter Valley, is on the cusp of experiencing immense change. What was once a rural area is now earmarked for significant growth. With this in mind, when the Diocese of Maitland-Newcastle made the decision to deliver the township its first early education centre, the Diocese ensured it incorporated engaging play-spaces that invoked the township’s rural foundation and rich Aboriginal history. A strong, local Aboriginal influence has been incorporated into the centre design - including room names, to reflect the history of the area, and was reinforced with a smoking ceremony at the official opening of the centre. Additionally, circle forms radiate throughout the playground, reflective of patterns seen in nature, indigenous culture, and rural settings. “Innovation, nature, local culture and community are the cornerstones for the design of the St Nicholas Early Education Centre in Lochinvar, considered by many to be an educators dream and every child’s wonderland of play experiences,” said Kerri Armstrong, Operations Manager at St Nicholas Early Education. And it’s not just children and educators who are impressed with the state-of-the-art centre. On the back of the opening of the Lochinvar premises, Kidsafe Australia recently cited St Nicholas Early Education as one of 19 national leaders in play-space design. Kay Lockhart, Manager of the Kidsafe NSW Playground Advisory Unit, said that the Lochinvar project received a Highly Commended Kidsafe National Playspace Design Award because the judges agreed that the well-designed outdoor learning space allowed children to move freely throughout. “The variety of play provisions allows children to explore, to engage with natural elements, to investigate and to feel a sense of wonder. The sweeping curved shapes and paths create inviting spaces for multiple uses,” Kay said. The design of the Lochinvar centre, as well as creating a safe play space, is underpinned by the importance of children’s self-determined play. “Play provides opportunities for children to learn as they discover, create, improvise and imagine,” Kerri said. 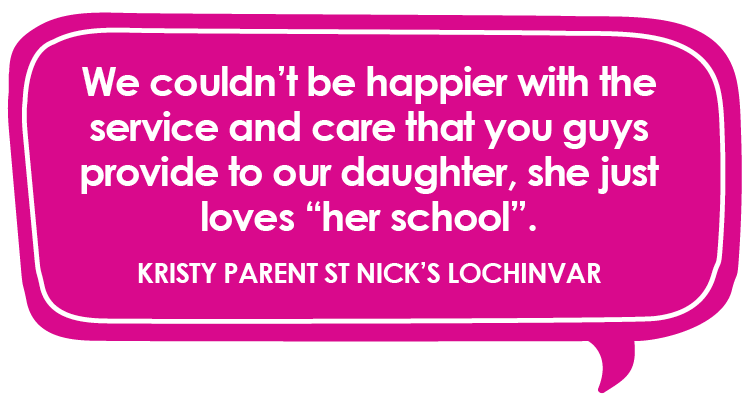 If you are interested in enrolling your child at St Nicholas Early Education Lochinvar, or if you would like to learn more about any of our centres, please contact us here. You can also contact us by phone at (02) 4979 1110. To stay up to date with all things St Nicholas Early Education, please subscribe to our newsletter and be sure to follow us on Facebook, Instagram and YouTube!